Happy New Year and welcome to #ThrowbackThursday. 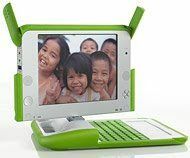 Today we'll look at The Innovative Educator's early coverage of One Laptop Per Child (OLPC). Background: With the advent of these low-cost learning tools, teaching in a one-to-one environment will become more and more prevalent. Who might be interested: Anyone who is using low cost laptops who is interested in how they came into being. Favorite excerpt: With the advent of these low-cost learning tools, teaching in a one-to-one environment will become more and more prevalent. Reader question: How have low cost laptops changed what happens where you work? As most Innovative Educators will agree, the key to having a successful 21st Century classroom is equity and access to some key technology tools like a laptop and digital video camera. Unfortunately, cost has been a huge factor, until now. Many are familiar with Nicholas Negroponte, MIT’s visionary behind the $100 laptop. The dream has finally come to fruition as not only has Negroponte’s XO laptops been released, but he has also inspired the development of an entire class of low cost laptops ranging from $200 - $500. I will be personally testing out some of these new devices and watching how well they work in the classroom.